Banff & Buchan MSP Stewart Stevenson will be holding a series of surgeries in his Mobile office in Central Buchan villages on Friday 9 October. The surgeries have been rearranged from his summer tour when the recall of Parliament meant that his scheduled series of stops that day had to be postponed. “It was unfortunate that owing to unforeseen circumstances I had to postpone my surgeries which had been scheduled in Central Buchan. “However, I will be keeping my commitment to these villages and my surgeries will take place on Friday 9 October as I feel that even in this age of instant communications it is important to be accessible to constituents in their own communities. Banff & Buchan MSP Stewart Stevenson will be available for consultation in his mobile office at the following locations. No appointment is necessary although constituents are welcome to phone the Constituency Office in advance on 01779 470444 to advise their attendance. 13.45 - 13.55 NEW LEEDS, Manse St.
Banff & Buchan MSP Stewart Stevenson has written to congratulate Charlie Duncan, manager of Fraserburgh FC for almost 25 years, ahead of his 1000th game in charge this Saturday. The Fraserburgh manager will clock up this remarkable achievement in the coming Scottish Cup replay against Bonnyrigg Rose Athletic. Additionally, North East SNP MSP Maureen Watt has lodged a motion in the Scottish Parliament congratulating Charlie Duncan and Fraserburgh FC on their long and successful partnership. “For any manager to be in charge of a football club for 1000 games and almost 25 years is a remarkable achievement, but at this level of the game it is truly exceptional. Detailed research to identify sites beneath the North Sea where carbon dioxide can be stored safely will be backed with Scottish Government funding, it was announced today. The Scottish Government will contribute £75,000 towards the Scottish Centre for Carbon Storage study. Previous research has shown that Scotland can accommodate industrial emissions generated in Scotland and North East of England for the next 200 years. The research will now make detailed assessments of the potential of specific sites. "Carbon capture and storage will play a critical role in Scotland's future energy mix and has the potential for a whole new industry supporting up to 10,000 new jobs. "We already know that Scotland has the storage capacity, the natural resources, and the technological know how for CCS to reduce emissions and produce clean energy. "The second phase of this collaborative research, which also includes financial contributions from all industrial partners, will further assess carbon dioxide storage sites under the North Sea. "We have been pushing hard in Europe to promote CCS opportunities in Scotland and will bid to lead the EU's CO2 transport and storage network study later this year. "We also continue to press the UK Government for quick action on the CCS competition, where we are hopeful that a Scottish entrant will be successful. We want to see CCS develop in Scotland and demonstration projects as soon as possible. Scotland can be a world leader in CCS and we will take every possible step to make this a reality." Halcrow Group Ltd will continue to audit the management and maintenance of the Scottish Trunk Road network for the next seven years Transport Minster Stewart Stevenson said today. The announcement comes on the award of a performance monitoring contract following exercise a tender exercise for the seven year commission taking into account both quality and price. “Scotland’s trunk road network is estimated to have an asset value of over £17 billion and our operating companies currently employ around 1200 people collectively. It is therefore vital that we have in place systems that ensure we continue to give value for money while delivering the highest possible standards of work in a sustainable way. The estimated cost of monitoring and auditing the management and maintenance of Scotland’s trunk roads over the term of the commission is around £18m. The contract itself provides assurance to Scottish Ministers and the travelling public that value for money and levels of service are being maintained across the network. "Halcrow's expert team is delighted to be appointed by Transport Scotland to this important role. We look forward to working with Transport Scotland and its maintenance contractors to deliver value and innovation, putting Scotland at the forefront of international best practice." The new contract will replace the current contract for the Performance Audit Group (PAG) in when it ends in December 2009. As with the current PAG contract, the new commission will be undertaken by Halcrow working in association with PricewaterhouseCoopers LLP, Scott Wilson and TRL. As a further development, Transport Scotland has also selected four consultants – IBI Group, Mott McDonald, Mouchel and Serco Integrated Transport - for its Network Operations Framework Agreement. Through this agreement, these providers will support the continued development and innovation of the Traffic Scotland service. The framework approach is designed to help deliver further value for money by engaging specialist consultants to help support the Government’s objective of improving journey time reliability. The Church of Scotland has welcomed guidance detailing how every congregation can measure its own carbon footprint and then take steps to reduce it. Today, Eco-Congregation Scotland will publish a report, entitled “Climate Change: Managing Your Carbon Footprint”, which urges congregations to manage, monitor and reduce their energy consumption. The launch will take place at St Andrew’s and St George’s Church in Edinburgh, as churches celebrate a key milestone in the bid to tackle climate change through practical action by grassroots members. The report says simple measures, such as recycling materials and insulating hot water pipes can go a long way in reducing carbon emissions, as well as fuel bills. The Rev Ewan Aitken, Church and Society Council secretary and Eco-Congregation Scotland convener, said: “The Church of Scotland believes congregations can be the catalyst for change in countries in the fight against global warming by actions as well as words. “Meeting the ambitious targets set by the Climate Change (Scotland) Act will be a challenge, and it will require all of us to work together – so I applaud this excellent work with congregations as a helpful part of that effort. At the May General Assembly, ministers instructed every Church of Scotland congregation to make year-on-year reductions of five per cent in their carbon footprints. HRH The Princess Royal has officially re-opened the historic pier in the popular Ayrshire seaside town of Largs following CMAL’s £6M project to safeguard the future of the pier. HRH The Princess Royal was cheered by hundreds of locals from Largs and the Isle of Cumbrae as she arrived to perform the opening ceremony on the pier which was originally built in 1834. As Largs Boys Brigade Pipe Band played alongside, five year old Chloe Smith from Cumbrae Primary School presented HRH The Princess Royal with a small bouquet of flowers. Children from all the local schools; Brisbane Primary School, Cumbrae Primary School, St Mary’s Primary School and Kelburn Primary School, were invited as special guests to mark the occasion following community involvement throughout the project which started on site last October. The new pier will provide shelter to the slipway, and overnight berthing for both the MV Loch Shira and MV Loch Riddon, the ferries operating on the route to the Isle of Cumbrae, as well as provide improved facilities for local fishermen and other pier users. The project was funded by CMAL with 75 percent of costs being met by the Scottish Government as part of its commitment to lifeline ferry services throughout Scotland. Banff & Buchan MSP Stewart Stevenson and Fraserburgh & District SNP councillor Brian Topping have welcomed work that is currently being done to create an online portal called "apply4homes" that will streamline the application process for housing in Aberdeenshire and Moray. The service is being created by Aberdeenshire and Moray councils in partnership with six registered social landlords and will create a single application form that can be used to register interest with all involved landlords, the first system of its kind in Scotland. Although the preferred application method will be online, users will still be able to apply by phone, in person or by post and will also benefit from a single application replacing a potential eight. “Applying for council or social housing can be a difficult process for many people and is something that I receive a lot of contact from constituents about. Something that will simplify the process and reduce the amount of paperwork involved has to be good news, and I am sure that people across Banff & Buchan will join me in welcoming the progress that is being made towards delivering apply4homes. “This is the first system of its kind in Scotland, but if it proves successful I am sure that it will not be the last. I am delighted that residents of Banff & Buchan will be amongst the first to benefit from the improvements that this system should bring." Scottish Transport Minister Stewart Stevenson was on hand to cut the ribbon for the brand new Park and Ride at Dalreoch railway station on Monday (21 September). Dalreoch is the first of ten new strategic Park and Ride sites to be developed by Strathclyde Partnership for Transport (SPT). SPT was allowed to bring forward capital spend from the 2010/11 financial year as part of the acceleration of expenditure on major infrastructure projects announced by the Scottish Government. In April, plans worth £5 million were approved to develop sites across west central Scotland. This money is to be spent in council areas outside the city of Glasgow to help reduce traffic on busy commuter routes. It was a condition of the grant that all projects should be completed by the end of the current financial year, and West Dunbartonshire is the first of our member councils to open a Park and Ride under these arrangements. 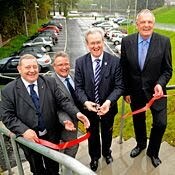 The new Dalreoch car park, which cost £120,000 to build, provides space for an additional 67 cars on the busy rail corridor between Dalreoch and Glasgow Queen Street, bringing the total number of spaces there to 87. Councillor Alistair Watson, Chair of SPT, welcomed the completion of work saying: "Dalreoch is the first of the new generation strategic Park and Ride sites to be completed this year as part of a £5 million capital investment programme. "We've clearly demonstrated our commitment to Park and Ride and our ability to deliver these projects alongside partner organisations. These facilities make commuting easier, promote increased use of public transport and offer more sustainable travel choices. "Better transport connections open up more opportunities to access further education, employment and health care. I am confident it will prove to be a big boost to the local economy." Dalreoch is the first of three new Park and Ride facilities to be built in the West Dunbartonshire Council area at a total cost of £670,000. Detailed design is under way for a £250,000 rail Park and Ride at Dumbarton Central station and a bus Park and Ride facility costing £300,000 at Kilbowie in Clydebank - both funded by SPT. West Dunbartonshire Councillor and SPT member William Hendrie said: "This is a major part of the delivery of our Local Transport Strategy, by encouraging use of the rail network and encouraging people to use their cars less. It will reduce the number of cars on the road in Dumbarton, congestion around the station, and traffic on the A82 to Glasgow. "Dalreoch Park and Ride joins the nearby National Cycle Route 7 to offer more sustainable travel choices for journeys to work. Its position close to the Loch Lomond and the Trossachs National Park attracts many leisure cyclists and walkers. Picnic tables and benches will be added later in the year at the riverfront and will provide a valuable resting point on the national cycle route and the final phase will see the creation of a high quality biodiverse planting system. "It has been a very successful partnership approach from public transportation agencies supported by excellent professional and contracting services from ID Consultants and JRB Construction." The new car park is fitted with 12 CCTV cameras to monitor activity. Dalreoch station now has a total of 28 cameras and two help points to provide passenger reassurance that the site is secure. This installation also marks the end of SPT's 13 year rolling programme of fitting CCTV systems at stations which began in 1996. Dalreoch Station was one of the first stations to have CCTV installed as part of this programme. It has delivered CCTV systems to 147 stations across the Strathclyde rail network at a cost of £12 million. Rail services across Scotland will be boosted as part of the new winter timetable announced by Transport Scotland. These new services follow in the wake of the significant improvements to services on the Edinburgh-Fife-Aberdeen line introduced last December and in the summer timetable earlier this year. The new timetable introduces additional services from Sunday 13 December, bringing benefits to thousands of passengers. The introduction of an early morning Dumfries to Glasgow and late evening Glasgow to Dumfries services. The new hourly service between Glasgow Central and Edinburgh via Shotts more than doubles the number of journeys running on that line. The new services offer faster journeys for Lanarkshire passengers travelling to and from Edinburgh and for West Lothian passengers travelling to and from Glasgow. Passengers in Ayrshire will welcome the new half hourly service between Glasgow and Kilmarnock, with 68 trains per day now calling at Kilmarnock, compared to 36 trains at present. In south-west Scotland, the timetable has been amended to maintain connections with Stranraer ferry services, offering a wider spread of services from Kilmarnock to Ayr and beyond in the evening peak. These changes also deliver a better range of southbound services from Ayr, enhancing commuting opportunities. Additional early morning and late evening services between Dumfries and Carlisle will be introduced, improving connections to London via Carlisle. The new early morning services from Dumfries will allow passengers to connect to a service arriving in London before 0930. The early services from Ayr and Gourock into Glasgow will provide a connection with the 0630 Glasgow to London Euston service, while the additional North Berwick service to Edinburgh will provide a connection with the 0700 Edinburgh to London Kings Cross service. Ferry operator Caledonian MacBrayne (CalMac) today (September 21, 2009) announced that it is making a further 22 changes to the Clyde and Hebrides ferry timetables. CalMac Ferries consulted widely with the local communities and received the go-ahead from the Scottish Government to make the changes. The changes to the winter timetable will come into effect on Sunday 25th October 2009 and are now available to book on-line. The summer sailings will be available to book later in the year. The timetable changes, which include the introduction of a number of additional sailings on some routes, are largely aimed at improving connectivity and better integration with bus and rail services. “These are welcome changes, which reflect the Government’s commitment to improving ferry services to our remote and island communities. Ferry services are a vital lifeline to the communities they serve, especially in these challenging economic times, and through the Scottish Ferries Review we’re looking at what further enhancements can be made to improve services across the network. Banff & Buchan MSP Stewart Stevenson has welcomed the Finance Secretary’s publication of the draft Scottish budget for 2010/11. This is the first budget to contain a real-terms decrease in spending since devolution, following £500 million of cuts imposed by the Treasury in the teeth of economic recovery. “The Scottish Government has faced up to its responsibilities and made the tough decisions that were forced upon it by the Treasury’s insistence on a real-terms cut in Scotland’s budget for the first time since devolution. “Accelerating capital spending in the last budget was essential in protecting jobs and it is vital that the UK Government heed the calls from the Scottish, Welsh and Northern Irish Governments to allow a further acceleration of capital spending this year to help us emerge from the recession. “Despite the tight financial settlement, the SNP Government has demonstrated its determination to protect frontline services, as demonstrated by NHS Grampian’s planned budget increasing from £660.7 million to £678.6 million and continued funding for the substantial increase in police numbers that has already been delivered. “We are still a long way from recovery, but the SNP Government is demonstrating its determination to get there no matter how many obstacles others may put in Scotland’s path. Labour should end their childish refusal to acknowledge the cuts that are clearly being made to Scotland’s funding and for once engage the Scottish Government in a positive manner in the coming budget negotiations”. Banff & Buchan MSP Stewart Stevenson has welcomed the announcement that Strichen Community Park has been awarded £121,466 under round five of the LEADER programme. The money will be used to fund a Café and interpretive centre in the park. Maud Village Trust also received £50,571 from the fund, towards a community recreational area in the centre of Maud. Rural Aberdeenshire’s LEADER programme, funded by the Scottish Government and European Commission, has approved 54 projects in the year since its launch in June 2008 and has awarded £1.6 million. Strichen Community Park and Maud Village Trust were two of the nine projects across Aberdeenshire to receive funding under the fifth round of awards. “The announcement of this funding is excellent news for the local communities in Strichen and Maud. In Strichen, the community park plays an important role in local life, and I am confident that this will only be enhanced by the Café and interpretive centre that is to be built. “The further development of the Old Mart site in Maud is also a welcome boost to the village, transforming another part of the site into a garden and play area that everyone can benefit from. Banff & Buchan MSP Stewart Stevenson has given his support to the Lollipop Person of the Year 2009 event sponsored by Kwik Fit Insurance which is to be launched later this month. The event will help to raise awareness of road safety issues and highlight the importance of lollipop people to children and schools. “Lollipop women and men deserve a huge amount of recognition for the work they do in respect of teaching children road safety. They are greatly respected and loved by the children that they help and also by their local communities. Their dedication to their young charges is second to none. “I would therefore urge all schools in Banff & Buchan with a lollipop person to get involved in this event, detailing why their lollipop person deserves this special award. 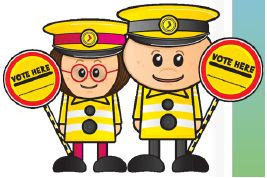 “As well as casting their vote, School pupils can also explain why they are nominating their Lollipop person which can include drawings, poems, songs and videos. For additional information, please visit: www.bestlollipop.co.uk. Postal entries should be sent to: Lollipop Person of the Year, c/o The BIG Partnership, Box 190, 98 Woodlands Road, Glasgow, G3 6HB. The competition will also announce 12 regional winners from the UK who will receive £500 worth of holiday vouchers and each of the 12 schools will be awarded £100 of book tokens. A landslip which caused the temporary closure of the A83 at the Rest And Be Thankful has been cleared and the road will reopen to all traffic at 3pm today. Following prompt action by the landslide patrol that identified the likelihood of a landslide in this area, swift action has been undertaken to clear over a thousand tonnes of debris, repair the lower embankment and clean the road. Thorough safety checks and geotechnical inspections have concluded and traffic management systems are now being installed. “I’m delighted the A83 at the Rest and Be Thankful is to reopen just 48 hours after the landslip, minimising inconvenience and disruption to the local community. The response has been swift and we appreciate the patience shown by the general public while the road was made safe and brought back to normal operations. There will be continued presence by Scotland Transerv staff in the coming days to monitor hillside conditions as well as manage traffic. East Lothian rail services are set for a significant boost, Transport Minister Stewart Stevenson revealed today. New services between Edinburgh and Dunbar will be introduced from the commencement of the winter timetable next year and a study undertaken looking into a new hourly service from Dunbar. From December 2010, ScotRail will assume control of the 06.30 Dunbar to Edinburgh Monday to Friday commuter service, and the 22.50 Edinburgh to Dunbar Friday service. A new late evening Edinburgh to Dunbar service on Monday to Thursday is also set to be introduced, subject to necessary industry timetabling processes. The new services will be introduced to the ScotRail timetable as part of the deal to extend the ScotRail franchise with First Group, which was signed in April 2008. “We are determined to identify what further improvements can be provided, and have secured the option to enable ScotRail to operate these additional services during the week. The feasibility study will also consider services from Edinburgh to Newcastle, Edinburgh to Berwick and the possibility of new stations at East Linton and Reston. The study is expected to take no more than a year to complete. Banff & Buchan MSP Stewart Stevenson has welcomed the announcement that two projects in Banff & Buchan are set to benefit from funding from the Big Lottery Fund. The Cetacean Research and Rescue Unit in Banff has been awarded £9,975 to purchase specialist equipment for the disentanglement of whales and dolphins from discarded fishing equipment. The award will fund 2 complete sets of scuba gear, 1 high definition camcorder, 1 underwater camera with monitor and tools/cutting accessories. Fraserburgh Bressuire Twinning Association has also received £2,972 towards a two-day multi-sports event for people with different degrees of disability in Fraserburgh and the surrounding area as well as Fraserburgh’s twin town Bressuire, which was held on the 22nd and 23rd of August. “I am delighted to hear that both of these projects have received much needed funding. The impact that this money will have on both projects’ work will be significant. “The work that the Cetacean Research and Rescue Unit does is extremely laudable, as nobody wishes to see whales and dolphins accidentally jeopardised by fishing equipment. Greenhouse gas emissions in Scotland, including international aviation and shipping, have fallen by more than 18 per cent since 1990, according to latest official statistics published today. Published figures for greenhouse gas emissions in Scotland indicate that total emissions, which include international aviation and shipping, were 56.9 million tonnes CO2 equivalent (Mt CO2e), compared with 61.0 Mt CO2e in 2006 - a 6.8 per cent reduction on 2006 figures. This means that compared to the 1990 baseline of 70.0 Mt CO2e, greenhouse gas emissions in Scotland have fallen by 18.7 per cent. "These figures for 2007 are good news, which show that we are making continued progress in reducing our emissions against the 1990 baseline. However, the data also demonstrates the size of the task now facing us - and the rest of the world - in reducing emissions. "The Scottish Government's commitment to making progress is demonstrated by the fact that, in the past year, we have passed our own world-leading Climate Change Act, which clearly sets out the Scottish Government's commitment to making the changes we need. "In 2010, which is the first year for the emissions targets contained in the Act, we will outline the plans and proposals that we will adopt to set us on a trajectory towards a low-carbon future." As a party to the UN Framework Convention on Climate Change (UNFCCC), the UK is required to submit to the UNFCCC an annual inventory of greenhouse gas emissions. UK inventory data from 1998 onwards has been disaggregated to provide detailed emissions data for England, Scotland, Wales and Northern Ireland. The greenhouse gas emissions data for all four countries of the UK will be published through the National Atmospheric Emissions Inventory (NAEI) website on September 24, 2009. While the accuracy of the data used in the regional inventories is improving year on year, the estimates are subject to greater uncertainty than the equivalent UK estimates. Uncertainties arise due to uncertain or unavailable regional data. Improved data collection and estimation techniques lead to periodic revisions of historic data which make it inappropriate to use data contained in reports from previous years for comparative purposes. Banff & Buchan MSP Stewart Stevenson has called for more volunteers from Banff & Buchan to join the Children’s Panel and help improve the outlook for children in their local communities. Children’s Panel volunteers can make a huge difference to children that have been neglected, abused or who are going through troubled times. “Some of our young people find themselves in extremely difficult situations that can be understandably overwhelming. Those in particularly vulnerable situations need extra help to get their lives back on track and deal with the pressures they are under. The Children’s Panel, made up of volunteers in local communities, can be enormously important by ensuring the support that vulnerable children need is available. “Helping young people through such difficult circumstances can be enormously rewarding and makes a real difference to people’s lives. There are no special qualifications needed and people from all backgrounds are encouraged to volunteer. 1) The Children's Panel is unique to Scotland and was established in 1971 to address the needs and behaviour of children and young people who face serious problems in their lives. These problems can include, for example, a child being abused, a child failing to attend school, the child's parents having difficulty looking after them or a child committing an offence. 2) Children are referred to a children's hearing where compulsory measures of supervision are thought to be needed. A children's hearing is a lay tribunal of three panel members. The child, parents/carers and relevant professionals all normally attend the hearing and take part in the discussion. The children's hearing considers and makes decisions on the measures required to best meet the needs of the child or young person before them. The "needs" of the child include addressing any "deeds". 3) During 2007 - 2008, 50,314 children were referred to the Children's Reporter. The majority of cases are referred on non-offence grounds for reasons of care and protection. 4) The Scottish Government is discussing proposals to strengthen and streamline Scotland's Children's Hearings system and improve the support given to vulnerable young people with stakeholders before legislation is introduced to the Scottish Parliament early next year. Responding to the UK Government's proposals to abolish attendance allowance and disability living allowance local MSP Stewart Stevenson has expressed concern that this will result in many vulnerable member's of society losing out as a result of it's abolition. For many people Attendance Allowance has become a lifeline and has enabled them to receive the care they require, without it many people would find it hard to survive with the pressures that their condition has brought. However the UK Government has proposed scrapping the allowances in favour of centralising the funds, a move which many say is in order to plug an ever growing funding black hole at the centre of social services in England. "As we have seen, faced with the need to cut costs the UK Government has once again opted to punish those most in need of assistance. What's more this move is spectacularly short sighted when we consider the benefits of the Attendance Allowance and the consequences of its scrapping. Many people gain independence and the ability to lead as normal a life as possible as a result of the allowance, who if denied it would require more intensive care resulting in ever increasing costs. "This is why I would urge the UK Government to abandon these plans and listen to the concern of the various charities and member s of the public who have expressed their concern over the effect these changes will have on some of the most vulnerable members of society." Banff & Buchan MSP Stewart Stevenson has expressed his concern over the temporary closure of the birthing unit at Fraserburgh Hospital. 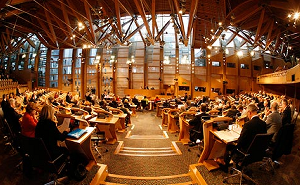 When NHS Grampian proposed closing the maternity unit at Fraserburgh in 2005, the MSP joined local campaigners on a march in Fraserburgh and met them at the Scottish Parliament when a delegation travelled down to hand in a petition to the then Health Minister, as well as raising the matter in Parliament, meeting with Ministers and speaking at Parliamentary Committees on the subject. “My friends in the Fraserburgh Maternity Action Group, whom I was proud to support previously in their highly effective campaign, alerted me to this situation last week and I immediately wrote to the Chief Executive of NHS Grampian Richard Carey on the matter. “The same arguments that prevailed in 2007 when NHS Grampian were told to think again by the former Health Minister hold good today. Banff & Buchan MSP Stewart Stevenson has warmly welcomed the news that the SNP Government has met its election pledge of putting 1,000 extra police officers on the beat in Scotland ahead of schedule. The latest figures reveal that there are now 17,278 officers across Scotland, an increase of 1,044 (+6.4%) since March 2007. This figure means that there are now more police officers in Scotland than there has ever been before. The Grampian area has seen an additional 19 police officers recruited in the last quarter to bring the number of officers serving there to 1,532. This is an increase of 158 since March 2007. “During the election the SNP promised to put 1,000 more bobbies on the beat over the lifetime of this parliament and I am delighted by the news that this promise has now been met well ahead of schedule. “The additional police officers in Banff & Buchan and across the whole of Scotland are working hard to make our communities safer and are having a real impact. When it comes to fighting crime, there really is no substitute for putting more officers on patrol and creating a more visible police presence.